It’s that time of year again. The sun has a kiss of heat. The birds are singing. The flowers are blooming. And your nose can’t. Stop. Running. For about a week a year, I’m knocked out by allergies and the last thing I want to do is cook. You might think of slow cookers as a winter tool -- stews and casseroles and all that. But I find the slow cooker useful when I’m sick, too. Slow cookers have a tendency to create murky flavors, but not so with the savory miso, sharp ginger, and assertive garlic. Between the three, they’re enough to make you forget about your stuffed nose and make you feel normal again. 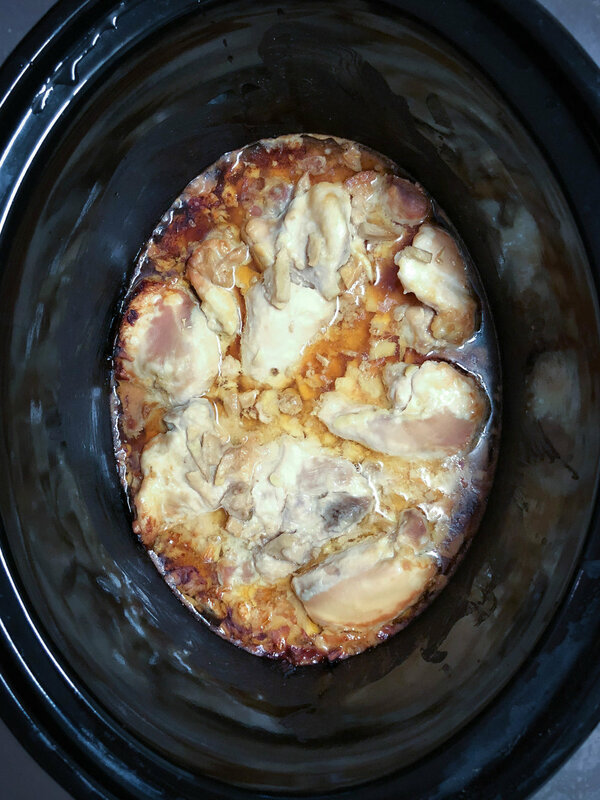 Miso ginger slow cooker chicken is actually the most popular recipe on my blog. Here's the original post. It doesn’t even have real measurements! So this time around, I’m getting more detailed but keeping the same spirit. No cheffy flourishes. No pre-heating or fussing. Just a quick make-ahead dinner you can prepare in the time it takes to make your coffee. 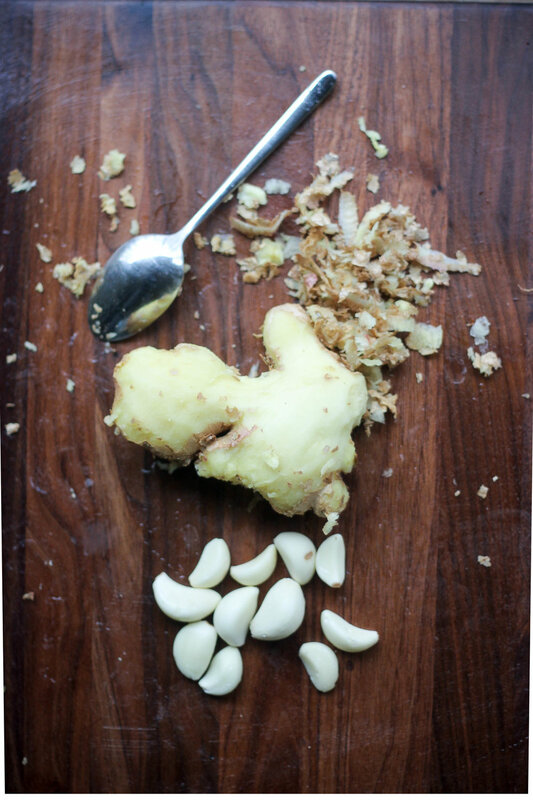 Peel and finely chop ginger. Peel and finely chop garlic. Mix miso with enough hot water to loosen it up, about 3 tablespoons. Add chopped ginger and garlic and mix. Add chicken to slow cooker. Coat with miso mixture. Cook on low for 8 hours. Taste the sauce. Depending on how watery your chicken was, you may want to reduce and concentrate the sauce. To do so, place the chicken in a separate bowl and add the sauce to a saucepan. Simmer on low until reduced. Re-mix sauce with chicken and serve. Why air-chilled? Unless otherwise noted, all chicken is water-chilled, meaning it was dunked in cold vats of water, resulting in diluted, watery meat. Air-chilling uses no additional liquid, meaning a stronger flavor and better textured meat. Air-chilled is a great way to go all the time, but especially for slow cooking. When sauteing or roasting, excess liquid can escape as steam. But in a slow cooker, the steam is trapped, so a water-chilled chicken will quickly go from water-logged to water-drowned. For a complete meal, add some veg to the sauce as you reduce it. I like enoki mushrooms, bok choy, or even broccoli. You can also do this if your sauce is too salty. Noodles (or zoodles) would also make a great addition. Boneless dark meat is okay. I accidentally bought boneless chicken thighs, even though the “rule” is to only slow-cook meat on the bone because the bone helps keep the meat moist. Well, you know what? The sauce and moisture from the chicken kept the chicken moist. It all worked out, so don’t sweat bone/boneless -- as long as you use dark meat. This is *not* the bang bang sauce from Cheesecake Factory -- a calorie-bomb of coconut curry and peanut sauce (I mean, it probably tastes amazing). This is the Laotian Bang Bang sauce -- a funky, fiery, sweet/tangy/spicy mix. Ie: a slow cooker friend. In my experience, the best slow cooker recipes are deeply, aggressively flavored (see also this miso ginger garlic chicken). Slow cookers get a bad reputation because they remind people of dull stewy mush. But that's why you fight against the murky "brown" flavor with brightness. In Laotian cuisine, bang bang is typically eaten with sticky rice (the way fries are eaten with ketchup). The same idea applies here: you want to match a tender, blank-slate food (slow-cooked chicken, sticky rice), with something that awakens the palate. Now you have the best of both worlds -- something soft and pillowy with something sharp and vibrant. My preparation includes two ingredients that aren't in classic bang bang sauce: gochujang and black bean sauce. I did this because slow-cooker sauces need to be thick. They'll get watered down a lot as the chicken cooks (such are modern chickens, very watery). Both sauces are thick, fermented and funky, and serve as the foundation for the more ephemeral top notes of this dish (ginger, lime, etc). So, to review: Laotian bang bang: wakes you up. Cheesecake Factory bang bag: knock you out. Skin an entire whole chicken (I do this because the fat doesn't have anywhere to go in a slow cooker. Since the slow-cooker is a pro at keeping meat tender, don't worry about going skinless!). In a small bowl, mix 2 tablespoons gochujang, 2 tablespoons of black bean sauce, 1 teaspoon chopped chili peppers (Thai chilis, piri-piri, whatever you have), 5 cloves of chopped garlic, 2 tablespoons chopped ginger, 1 tablespoon chili oil, 1 chopped lemongrass stalk (or 1/2 teaspoon of dried lemongrass), 1 tablespoon palm sugar, 1 teaspoon fish sauce, 1 pinch of dried ginger, 1 pinch of dried galangal (or just more ginger if you can't get this), 1 pinch of cardamom. Add enough water to mix, but not too much. Place chicken in slow cooker and pour sauce over chicken, making sure to get every crevice. Add one diced lime. Cover and cook on low for 7 hours. Serve with sticky rice and Thai basil.